Hey guys, I hope all of you are having (or had) a great "Spring Break" this year. If you're just getting back to reality today, you may have notice the world seems to be going a little crazy. Earthquakes in Japan, Revolution in the Middle East and Protests in the United States are just some of the many developments. Feedly is an innovative (yet familiar) little program that helps you stay up-to-date with all your favorite news and blog sources in one place. 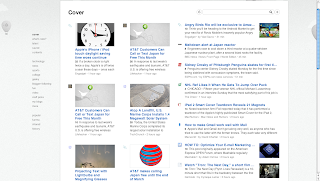 It manages your Google Reader RSS feeds and shows them to you in a easy to consume magazine-style format, starting with a cover page spanning all of the newest and most popular stories from your feeds. Out of all of the RSS Feed managers I've tried, this service is hands down my favorite. I have no doubt that if you are a news-junkie like myself, you will instantly fall in love. Thanks For The Love "College Candy"!